... started early, very early, at 04:00 hrs to be precise. This gave us time to get up, get dressed, brush our teeth and leave in the car that we had loaded the previous evening. There was little or no traffic at that time and so we made good progress arriving at Frampton at around 06:40 hrs to a glorious sunrise over the misty marsh, over flown by three Grey Plovers accompanied by a Dunlin that were illuminated by the sun well clear of the mist. The view must have been stunning from up there, no wonder they were calling so mellifluously. Mike Weedon and Matt Merritt of Birdwatching Magazine, who had organised the event to encourage birders to get out into the field as part of the 200 Bird Year Challenge, arrived soon after us. 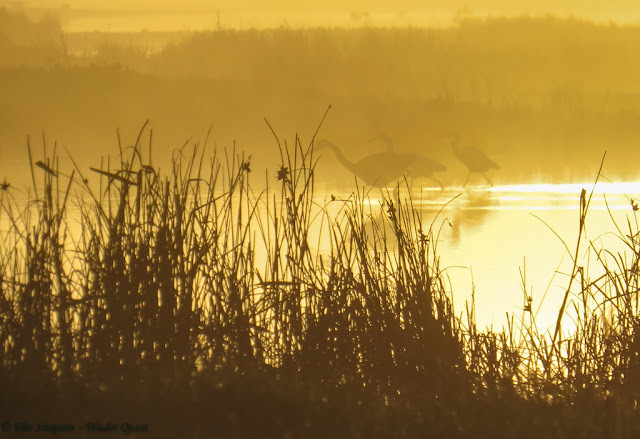 Toby Collett the RSPB Frampton reserve warden in addition to around fifty readers of the magazine, who had taken up Matt and Mike's challenge, also arrived as the sun rose into the clear sky burning off the mist taking some of the chill out of the morning air. 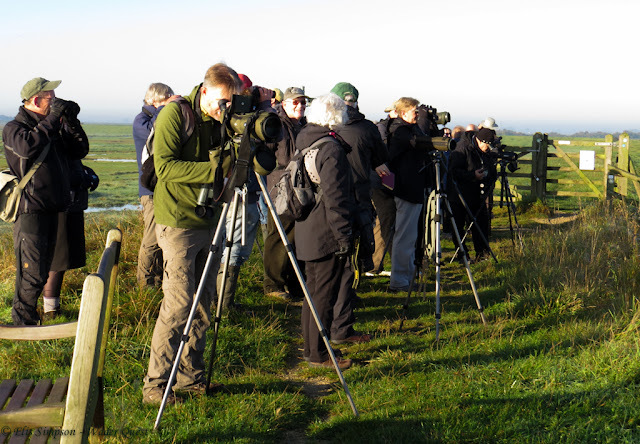 Along the track from the car park to the sea wall there were scrapes with many Dunlins feeding close in, these were closely scrutinised to see what else may be hiding among them. 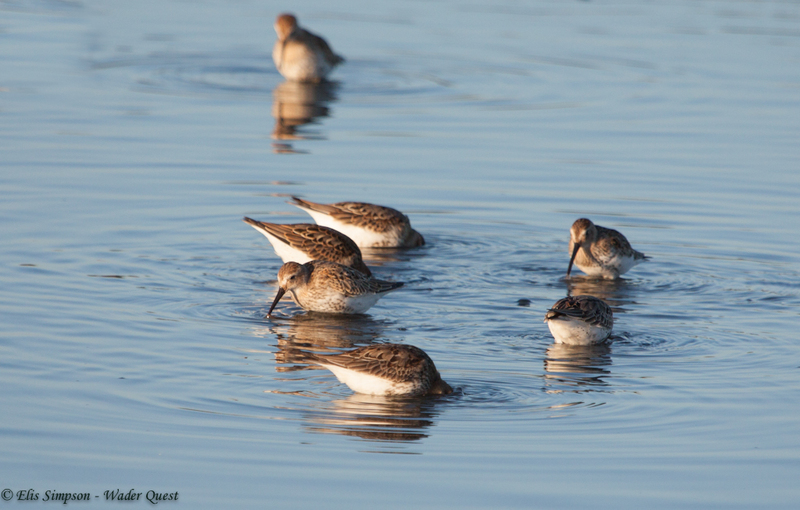 Dunlins on the nearest scrape. 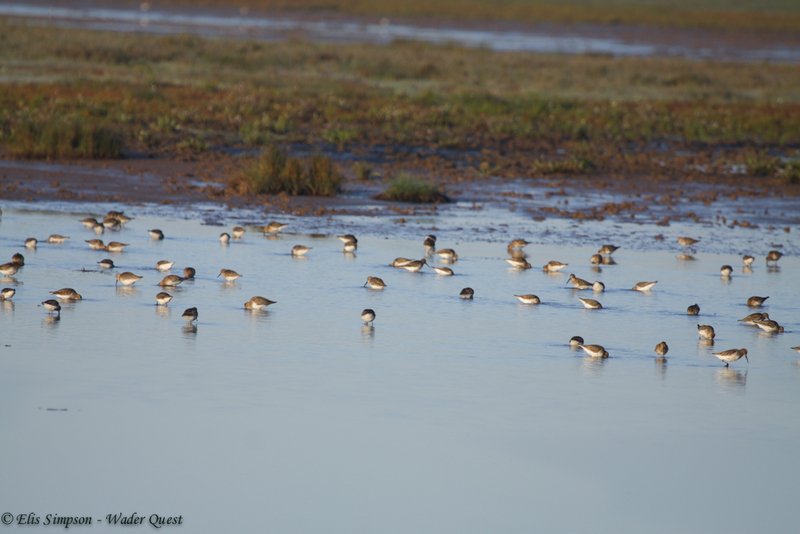 Among them was a single Curlew Sandpiper can you see it in the photo below? It is slightly larger, bulkier looking perhaps, and has a clear underside with no streaks. 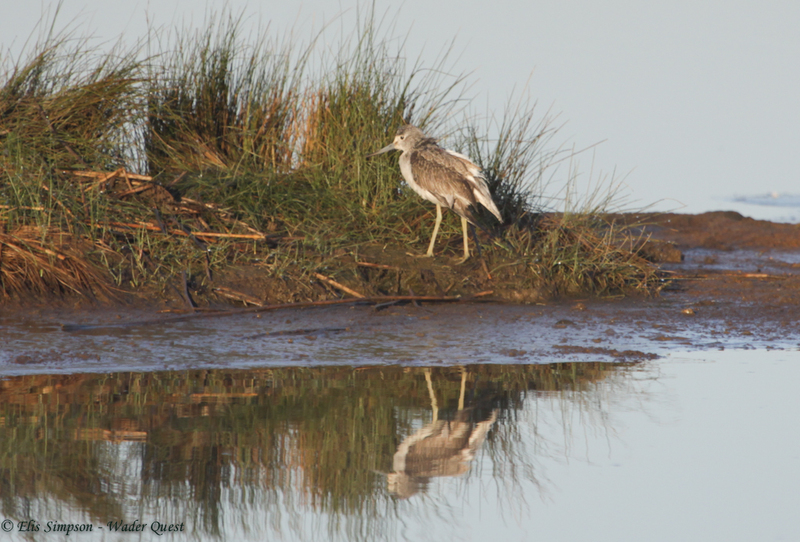 There were also a number of Common Greenshanks around too 'tew tew tewing' loudly and excitedly in the still morning air. There was one though that looked very much the worse for wear. I thought at first it may have just arrived but on closer inspection it looked injured, perhaps having narrowly escaped the attentions of a Peregrine Falcon, one of which was around during part of the day. 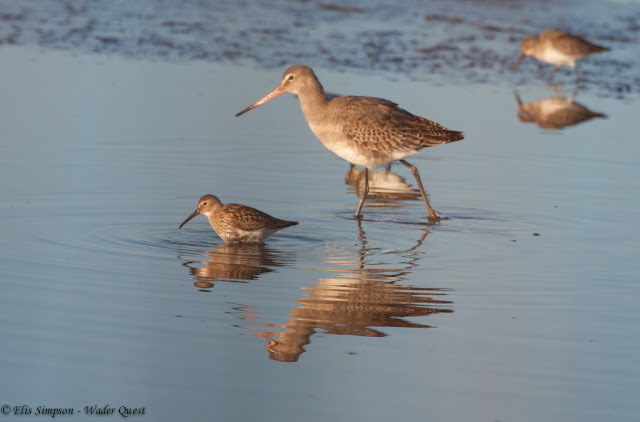 At one point a Black-tailed Godwit flew in to join the Dunlins neatly illustrating the diversity of form, shape and size among waders. 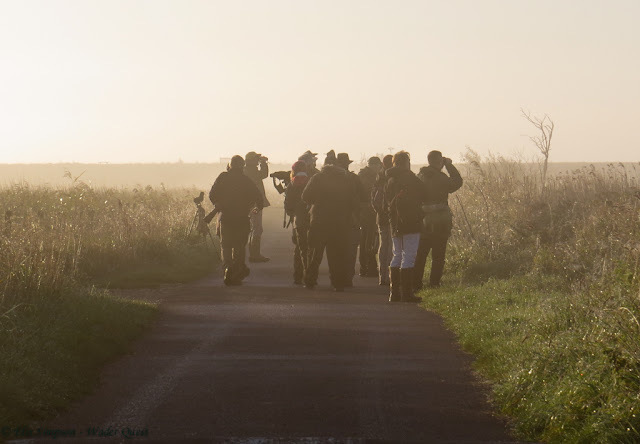 Now gathered on top of the sea wall with the rising sun beginning to warm our backs the group looked across the marsh. There we found many Ruffs dotted about the reserve, in small groups mainly, a few Common Snipe probing at the soft mud at the water's edge and the odd Spotted Redshank looking almost stately as they walked slowly through the shallow pools dipping occasionally to select something for breakfast. 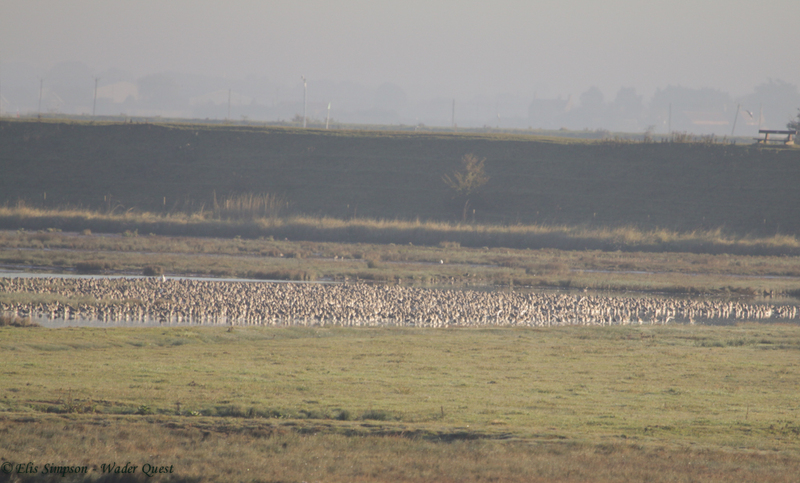 There was also a massive, grumbling, fidgeting flock, or omniscience to give them their proper collective noun, of a few thousand Black-tailed Godwits. 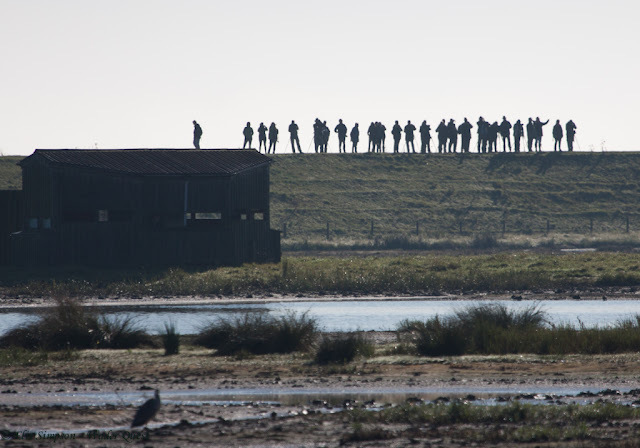 Occasionally, from this elevated position, when something disturbed or scared the birds on the marsh we were treated to short bursts of wader inspirations as unidentified or mixed species groups flew together in close formation first swishing low over the marsh and them upwards into the blue sky, coming back down again and eventually settling back as often as not from where they had started. An aggregation of godwits grumbling like old men on the marsh. From the sea wall the group went on around the reserve while Elis and I went to the Reedbed Hide to set up our Wader Quest display. There should be a rule about walking on the hide roof! We had a great time watching the waders and talking to the members of the public that entered the hide. 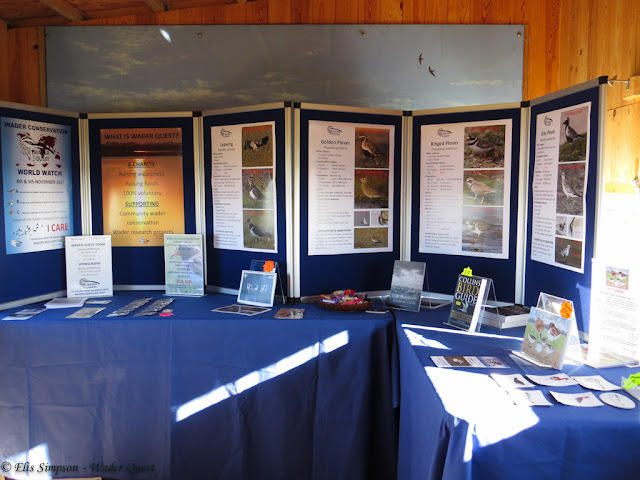 We were pleased with the interest our presence provoked and entered into many interesting discussions about what is happening to the world's wader populations. A hide-sized display fitted the bill perfectly. 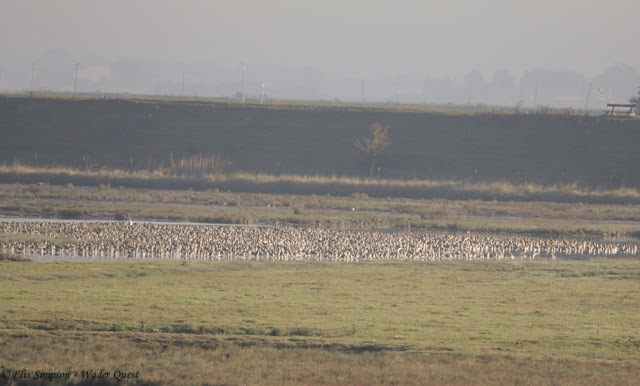 During the day we also saw a small orchestra of Pied Avocets, a deceit (I still hate that) of Northern Lapwings, a wing of Common Ringed Plovers, a walk of Common Snipe, a calling fly-over Eurasian Golden Plover singleton, Common Redshanks, a Wood Sandpiper, a Common Sandpiper, a single Bar-tailed Godwit and several Little Stints. 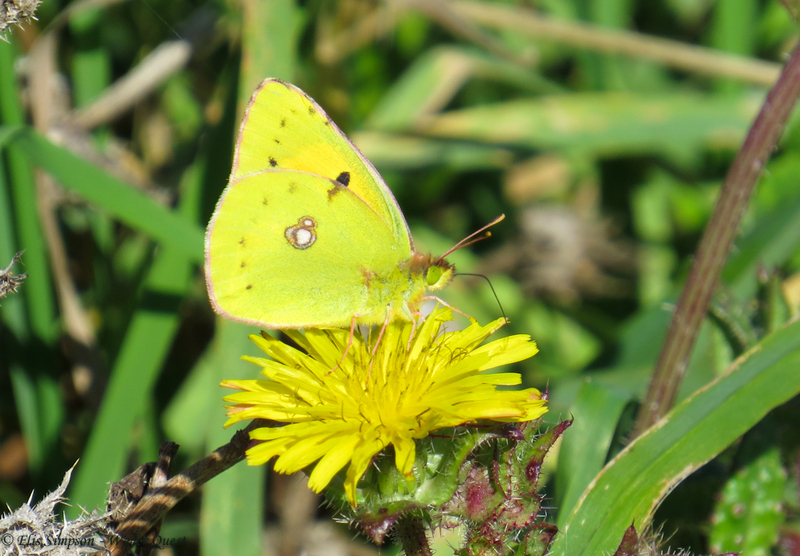 We also got very excited when a Clouded yellow butterfly flew past emptying the hide of birdwatchers turning them into butterfly watchers instead. 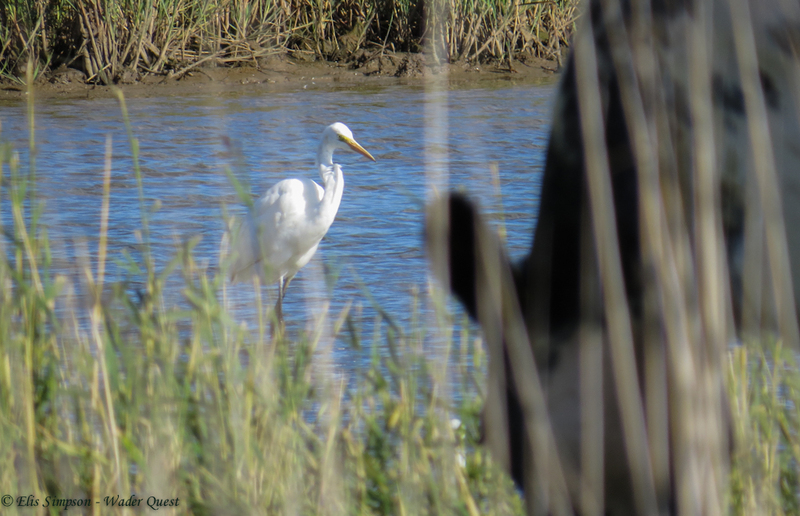 In addition to the waders (and butterflies) there was a Red-necked Grebe (which we didn't see) and a Great Egret which we did see - very well when the cows weren't standing in our field of view, plus a summering Whooper Swan with a wing injury that does not prevent it from flying but has stopped it making the long journey north. At the end of the day Mike Weedon had a species list in the eighties, not bad for a single reserve. After a pleasant but tiring day we headed home very content and didn't even meet too much traffic despite it being a Friday evening. 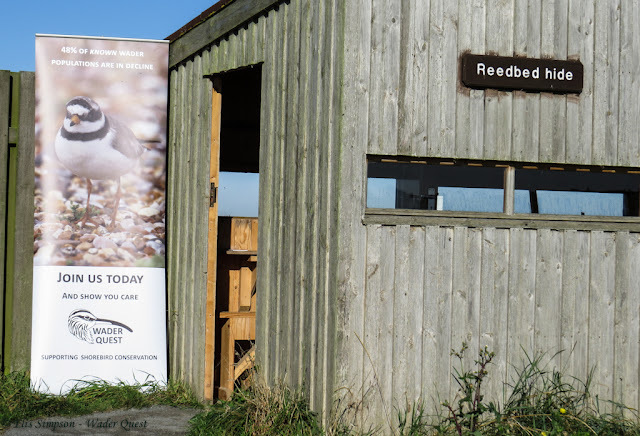 Many thanks to Toby Collett for allowing us to usurp the Reedbed Hide to promote Wader Quest and to Matt and Mike for inviting us to the event in the first place. It was a grand day all round.